Equipped with the latest 6-axis flight control systems and HD camera makes the quadcopter more stable and flexible when flying and take photos to memory your happy time. Wind resistant and can be flown indoors or outdoors. Easily control 3D eversion mode. With 4 in 1 battery charger, charge 4 batteries at one time. It means you can play about 30 minutes only need to wait for charging time once. BIG BUNDLE, Special Favor for a Limited Time! Updated Version X5C-1Drone with portable carrying case, total 3 batteries, 4 in 1 charger and extra blades. Take the whole drone kit out with no mess. Enjoy around 20min flight and charge all batteries together, save much of your time. Provide you with more fun. FEATURE: Equipped with the latest 6-axis Gyro flight control systems and HD camera makes the quadcopter more stable and flexible when flying and take photos to memory your happy time.2.4 GHz technology adopted for anti-interference(2.4GHz remote control). Even more than one quadcopter is flying at the same time they will not interfere with each other. 360 DEGREES 3D EVERSION: With pretty cool 3D eversion flying mode, easily flip and roll 360°by pressing one button. Make you more funs. CARRYING CASE: Anti-drop & Anti-shock Aluminium carring case,very strong and reliable, with custom cut out to fit your Syma X5C RC quadcopter /X5C-1 perfectly, and has some more room for additional batteries, chargers, propellers, parts, etc. 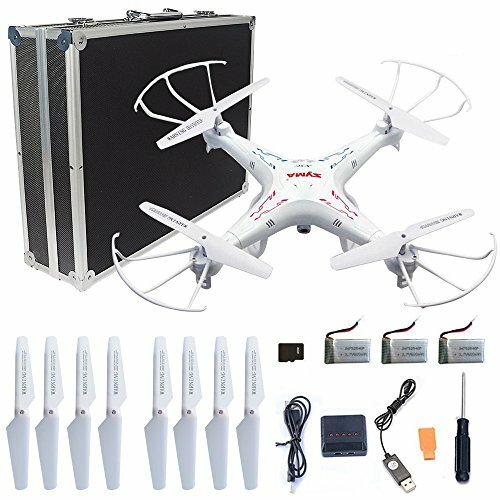 PACKAGE INCLUDE:1 x SYMA X5C-1 RC Quadcopter; 1 x 2.4G Remote Controller; 1 x USB charging cable; 4 x Protection frames; 2 x Landing skids; 1 x Screwdriver; 4 x Screws; 1 x 3.7V 500mAh Li-Po battery (Built-in); 1 x 4G Micro SD card; 1 x User Manual; 1 x SD card reader; 8 x Rotating blade; 4 x Rotating blade (Extra);2 x 3.7V 600mAh Li-Po battery (Extra), 1 x 4 in 1 charger (Extra). If you have any questions about this product by R RECOMFIT, contact us by completing and submitting the form below. If you are looking for a specif part number, please include it with your message.